It is 30 years since the animated film When the wind blows made its cinema debut in the UK. This wry, heartbreaking tale of an elderly couple who slowly succumb to radiation sickness in the week following a nuclear attack has a shocking power that makes it essential viewing, even today. Its release was particularly timely: the world’s inventory of nuclear weapons had just reached its peak of around 70,000 warheads. That arsenal has shrunk by three-quarters since then, in part due to the success of arms control agreements between the US and the Soviet Union (and subsequently Russia). The threat of nuclear war has, mercifully, receded. But over the past few years, nuclear cooperation between those nations has stalled. Russia has pulled out of several initiatives, including an agreement to work with the US on nuclear research and development, and pointedly did not participate in the March 2016 Nuclear Security Summit. The latest blow came in October 2016, when Russia withdrew from an agreement with the US to whittle down their stockpiles of weapons-grade plutonium. 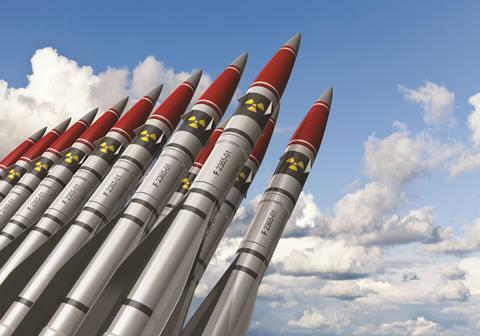 Although the material does not pose an immediate threat, the move is symptomatic of a broader breakdown in efforts to address the risks of nuclear proliferation. Once Donald Trump takes up residence in the White House, he should focus on rebuilding this relationship. The Plutonium Management and Disposition Agreement, signed in 2000, targets 34 tonnes of plutonium in each country: enough to make thousands of nuclear bombs, and accounting for about one-third of US stocks and one-fifth of Russian stocks. The agreement aimed to make the plutonium much harder to weaponise. In practice, there are two ways to do this. The first is to mix the plutonium with uranium oxide to make mixed-oxide (MOX) fuel, which can then be burned in nuclear reactors. The alternative is to simply treat the plutonium as waste: mix it with a ceramic and lock it into storage canisters with other radioactive waste, a strategy known as ‘dilute and dispose’. The MOX route looks attractive for several reasons. Using the plutonium as nuclear fuel alters its isotopic composition, making it more difficult to reprocess into weapons-grade material. And it is politically attractive to put this dangerous resource to good use – turning swords into ploughshares – rather than simply adding it to hazardous waste inventories. Unfortunately, the MOX strategy is also very expensive. When construction began in 2007 on a plant at Savannah River in South Carolina to make MOX fuel for light-water reactors, its price tag was an optimistic $5 billion (£4 billion). The US Department of Energy (DOE) recently revised that to $17 billion, saying that the plant might not be finished until the 2040s, and that its total lifetime costs could reach $50 billion. In February 2016, President Obama called for the MOX programme to be scrapped, preferring the much cheaper ‘dilute and dispose’ approach. This would see the plutonium treated at Savannah River and then stored in an underground repository in New Mexico. Russia argued that this change of plan meant the US had reneged on the agreement and withdrew. It is unlikely that Russia’s response was prompted by genuine concerns about whether the diluted plutonium could be resurrected. The agreement had already been amended in 2010 to allow Russia to burn its MOX fuel in ‘fast breeder’ reactors, which actually generate more plutonium than they consume – which could, in principle, also be reprocessed into weapons-grade material. Instead, it seems like an opportunist move to punish the US at a time when the nations are clashing over Syria, Ukraine and a host of other issues. One possible compromise would be to blend the weapons-grade plutonium with more plutonium from spent fuel before disposal, which could solve the isotopic stumbling block. However, Russia has attached so many unrealistic conditions to renegotiating the agreement that any kind of compromise seems unlikely. Even if the agreement really is dead, Trump should try to capitalise on his supposedly cordial relationship with Russian President Vladimir Putin – along with his much-vaunted deal-making skills – to restart nuclear cooperation. He should also remember that science offers an important conduit for that rapprochement. Scientists played a crucial role in establishing discussions on arms control, for example. The relationships between researchers can provide a solid basis for cooperation, enabling progress even in times of diplomatic stalemate. Despite this, Russia’s science community is becoming increasingly isolated from the rest of the world. In 2014, for example, Russia’s annexation of Crimea prompted the DOE to ban Russian scientists from its labs and barred its own scientists from visiting Russia. It’s another problem America’s new president will need to address – even if he is unable to strike a deal on nuclear cooperation – if he wants to avoid a return to the tensions of the 1980s. Thanks to Darya Dolzikova, research assistant in security studies at Georgetown University in Washington DC, US, and Edwin Lyman, senior scientist in the Union of Concerned Scientists’ Global Security Program for helpful discussions.